National Security Adviser Susan E. Rice announced that Suzy George will be named Deputy Assistant to the President, Executive Secretary of the National Security Council and Chief of Staff of the National Security Council staff.Â Ms. George will succeed Brian McKeon, who will soon depart the White House to become the Principal Deputy Under Secretary of Defense for Policy at the Department of Defense. Ms. George has served as a principal at the Albright Stonebridge Group LLC, an international strategic consulting firm, and previously with The Albright Group LLC, since 2001.Â From 1997-2001, Ms. George served as the Deputy Chief of Staff in the Department of State, overseeing the management and coordination of travel and meetings, as a liaison to the White House and other Cabinet departments, and working across the Department on a range of foreign policy initiatives for Secretary MadeleineÂ Albright. Ms. George has a BA from Mount Holyoke College, and a JD from the George Washington University Law School. “Today’s actions by the President and the Europeans are welcome, but weÂ mustÂ moveÂ quickly to deter Putin,” Senator Kirk said. “Following the attack of Malaysian Airlines Flight 17 by Russian-sponsored terrorists, and the confirmed shelling of Ukrainian territory by Russian armed forces, we stand on the cusp of the most serious armed conflict in Europe since the end of the Cold War. Senator Kirk and 37 GOP sent a letter to President Obama on March 26, 2014 requesting that any plans to share sensitive missile and defense information be canceled effective immediately, which can be readÂ here. On May 14, 2014, Senator Kirk penned an op-ed in the Chicago Sun Times calling for more aggressive sanctions against the Russian government, similiar to sanctions that had been placed against the Iranian regime. CHICAGO, IL â€” Illinois State Senator Jacqueline Y. Collins (D-Chicago 16th) proudly looked on last Thursday as Gov. Pat Quinn signed into law stricter rules governing the way charter schools conduct their admissions lotteries and spend public money. Collins sponsored the legislation, House Bill 3232, in response to high-profile charter school scandals that left families and taxpayers concerned about transparency and accountability in charter education. â€œI was pleased to work with educators, school districts and people of goodwill in the charter community who agree that high standards are absolutely necessary whenever public money is being spent,â€ Collins said. Earlier this summer, the governor signed another law Collins sponsored on educational choice. House Bill 4591 ensures that state funding stays with students whenever they transfer from a charter school back to a traditional public school operated by a school district, and vice-versa. â€œReplace judge who donated millions to defendant’s torturers,â€ say Rasmea Odehâ€™s lawyers and supporters, while prosecutors push for 10-year jail sentence. DETROIT, MI -Â Defense and prosecution attorneys will square off in Detroit federal court on Thursday, July 31, for what is expected to be a heated status hearing in the politically motivated deportation case against Chicago Palestinian-American community leader Rasmea Odeh. Supporters are gathering from across the Midwest to attend the hearing. Defense attorneys have demanded the removal for bias of the judge in the case, who with his wife and family has donated millions of dollars to support Israel, which tortured and imprisoned Odeh before she emigrated to the United States. They argue that Judge Paul D. Borman, a life-long supporter of Israel, cannot play the â€œneutral and detachedâ€ role that the law requires. Prosecutors, on the other hand, are expected to fight to keep Borman on the case and move to quash any details around Odehâ€™s bogus conviction — including extensive evidence of her sexual and physical torture at the hands of the Israelis. The Department of Homeland Security arrested Odeh on October 22, 2013, and charged her with Unlawful Procurement of Naturalization, for allegedly failing to disclose that she had been imprisoned by the Israelis in Palestine over 45 years ago. The feds charge that she failed to mention, in her 2004 application for U.S. citizenship, that she was arrested in Palestine and tried in an Israeli military court that â€œconvictsâ€ 99.74% of Palestinians who come before it. Her conviction by Israel came in the wake of vicious physical and sexual torture by the Israelis. Odeh recently rejected an unusual federal plea deal that would have seen her serve only six months of a possible 10-year sentence, and allowed her to remain in the U.S. for another six months before being deported. She has instead chosen to fight the U.S. charge. The full trial is set to begin on September 8.
â€œClearly, one who has been a life-long supporter and promoter of Israel and has deep ties to the State of Israel spanning over 50 years, who no doubts believes that Israel is a great democracy and protector of human rights, cannot be â€˜reasonablyâ€™ said to be impartial when these claims of torture and illegality are raised by a Palestinian defendant,â€ argue Odehâ€™s attorneys, Michael Deutsch and James Fennerty, in their brief. Odehâ€™s supporters and her legal team are demanding that federal authorities drop the charges against her. They plan to fill the courtroom and gather outside to show their support for her on Thursday. More information on Odehâ€™s case can be found at uspcn.org and stopfbi.net. The National Rasmea Defense Committee includes United States Palestinian Community Network, Committee to Stop FBI Repression (CSFR), Coalition to Protect People’s Rights (CPPR), 8th Day Center for Justice, American Arab Anti-Discrimination Committee (ADC)-Chicago, American Muslims for Palestine, Anti-War Committee (AWC)-Chicago, AWC-Minneapolis, Arab Jewish Partnership for Peace and Justice in the Middle East, Arab Resource and Organizing Center, Chicago Alliance Against Racist and Political Repression, Committee Against Political Repression, Council on American-Islamic Relations (CAIR)-Chicago, CAIR-Michigan, Friends of Sabeel-North America, International Jewish Anti-Zionist Network, International League of Peoples’ Struggle-U.S., Jewish Voice for Peace, Lifta Society, National Lawyers Guild (NLG), National Students for Justice in Palestine, Palestine Solidarity Group-Chicago, Palestine Solidarity Legal Support, Palestinian Youth Movement-USA Branch, St. Louis Palestine Solidarity Committee, United National Antiwar Coalition, US Campaign to End the Israeli Occupation, and Women Against Military Madness. WASHINGTON â€“ U.S. Senator Mark Kirk (R-Ill.) released the following statement following Robert McDonald’s confirmation as Secretary for the Department of Veterans Affairs. Earlier this month, Senator Kirk and McDonald met to discuss his priorities at the VA, if confirmed, and what can be done to eliminate the culture of corruption and abuse that has permeated the agency, in particular at Illinois VA Hospitals like Hines VA in Maywood. Last Friday, White House Deputy Chief of Staff Rob Nabors met with Senator Kirk, federal elected officials and Hines VA staff, including Director Joan Ricard to discuss the ongoing corruption at Hines, and to continue the push for necessary reforms within the VA. At Senator Kirk’s urging, Nabors met with several whistleblowers and VA patient Michael Swan, to further discuss their frustration with the agency, and in Swan’s case, how his health had suffered dramatically due to the inadequacy of care during two years of waiting for appointments. Chicago Palestine Solidarity Activists Demand the City Council Drop Boeing from Air and Water Show! Posted by Admin On July - 30 - 2014 Comments Off on Chicago Palestine Solidarity Activists Demand the City Council Drop Boeing from Air and Water Show! Chicago activists demand accountability for all those involved in continuing the current siege of Gaza. As human rights continue to be trampled in occupied Palestine, it is imperative that the global community refuse to reward this campaign of terror and destruction. Solitary Activist allege that Boeing weaponry is responsible for many of the over 1000 dead and more than 6000 seriously wounded Palestinians in Gaza in the past three weeks. The dead are mostly civilians, including over 200 children. Israelâ€™s F15 fighter jets and Apache helicopters are made by Boeing. Boeing has made billions from the sale of weapons for use in Israel’s attacks, as part of its eight year old siege of Gaza. In light of Boeing’s complicity with and profit from the inhumane and illegal siege of Gaza, the City of Chicago should drop Boeing from the sponsors of the Air and Water Show. Boeing is a major sponsor of Chicagoâ€™s annual Air and Water Show, which will take place later this summer. Many people come to the lake shore every year to see displays of jets and other aircraft, but this experience should not implicate event participants and the City of Chicago in the ongoing crusade of bloodshed and dehumanization of the Palestinian people. No company that makes profit from the slaughter of civilians should be included in city events and programming. To this end, the organizers of this event will be hosting a Press Conference & Die-in on Wednesday, July 30, 9:30 a.m. at City Hall, 121 N. LaSalle St., 2nd Floor. This action is intended to draw attention to Boeing’s role in the ongoing human rights abuses in Gaza, as well as to the City Councilâ€™s responsibility to keep City events free of corporations who profit from civilian death. The die-in will dramatize the deaths of Palestinian civilians who have been killed in the past few weeks. This action is organized by Anti-War Committee â€“ Chicago, Jews for Justice in Palestine, U.S. Palestinian Community Network and 8th Day Center for Justice, and is endorsed by a dozen other Chicago-based social justice groups. CHICAGO, IL – Thousands of individuals across northern Illinois are still unemployed. With prospects for getting a job remaining somewhat bleak, job seekers bite at any opportunity they feel may land them work. Given that scenario, the environment is ripe for scammers. Reports of “job opportunity” scams continue to come into the Better Business Bureau (BBB) from people seeking employment and who are at best left disappointed when the job turns out to be a hoax. The types of scams vary; offers are usually found on Craigslist, ads in local newspapers or contacts made online. Be suspicious – Be wary of online-only interviews and when a position is offered after just a few brief questions. Check the location – Verify the business is located where they say they are. Advanced payment – Be suspicious of any advanced payments, whether they are to be received by you or a payment you are requested to make. Great Salary – A position that pays extremely well for little work and little experience is suspect. Protect your accounts – Do not provide any credit card or banking information. Poorly written ad – If you notice a number of typos, the ad reads as if it were translated or isn’t clear what the job entails it’s a scam, you could be at risk of being scammed. For more information, visit bbb.org or follow us on Facebook and Twitter. African American Cartoon Series Puts a “Ninja” Spin on Slavery – And a Video Game is Also in the Works! Posted by Admin On July - 30 - 2014 Comments Off on African American Cartoon Series Puts a “Ninja” Spin on Slavery – And a Video Game is Also in the Works! Berlin, NJ — (BlackNews.com) — There was Roots, then 12 Years a Slave, and now in development is a cartoon series called Mortolkosbei. Picture two runaway slaves who are fighting for their freedom by becoming cyborg ninjas. They must enslave their future descendants named Mortolkosbei. Created by cartoonist Justin Serrette Jr, who also backed Aaron McGruder (creator of Boondocks) on his movie Uncle Ruckus. Mortolkosbei is also being developed into a fighting video game called Mortolkosbei Mugen. Similar to Mortal Kombat, players will be able to choose a wide list of characters, combos, and finishing moves. Mortolkosbei will take place in the 1600’s then fast forward to early 1900’s during the renaissance of Black Wall Street. In Black Wall Street, the slaves will befriend a scientist, chemist, and engineer to help build and rebuild them into the ultimate killing machines. The characters will feature a wide range of fighting styles ranging from Jeet Kung Do, Jiu Jitsu, Greco Roman Wresting, and so on. The character MortolKosbei first appeared in another cartoon Serrette created called Alienz Wit’ Afros receiving over a million YouTube views. Serrette is also the mastermind behind Crazyafroanimation, a business where he produces African American cartoons and has an obscene clothing line. He currently produces with Riley Martin, who does radio on the Howard Stern Channel as well as voices on the Cartoon Network. They have also taken his book The Coming of Tan, and produced it into a cartoon series. Screen shots for both the video game and cartoon are available at www.Crazyafroanimation.com. Chicago, IL â€“ The PrivateBank and the Cook County Land Bank (CCLBA) announced today the creation of a new partnership to help eligible participants realize the dream of homeownership by investing in rehabbing vacant homes in Cook County. The PrivateBank will provide up to $10 million in financing to support the purchase and rehab of homes owned by the CCLBA. Buyers will be selected by local housing nonprofits that will identify and prepare home buyers. The PrivateBank and the CCLBA will work with a pre-qualified pool of contractors to ensure the homes are move-in ready. â€œThis innovative new program directly addresses the difficulty that many prospective homeowners face when trying to find financing for homes in distressed communities that require extensive rehab because they are vacant and abandoned. By removing challenges faced by communities when tackling neighborhood abandonment and vacancy we can help revitalize our neighborhoodsâ€ Toni Preckwinkle, Cook County Board President. â€œThis partnership is a great example of public and private sectors coming together to make a difference at the neighborhood level. 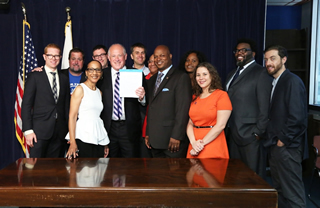 This program will not only fuel economic growth and neighborhood revitalization by connecting future homeowners with vacant homes and affordable mortgages but will get more homes back on the tax rolls,â€ said Bridget Gainer, Cook County Commissioner and Chairman of the Cook County Land Bank. The PrivateBank/CCLBA partnership will require all homeowners complete housing counseling prior to closing. The CCLBA will continue to partner with the National Community Stabilization Trust, Fannie Mae, Freddie Mac, banks, and other public and private entities to acquire homes for the program. CHICAGO, IL â€“ The Hiring Our Heroes event, one of the largest efforts to help Veterans, military service members and their family members to find employment, returns to Chicago on Wednesday, July 30. The U.S. Chamber of Commerce, Illinois Department of Veterans Affairs (IDVA) and Illinois Department of Employment Security (IDES) are primary sponsors. The event is from 12:00 p.m. to 3:00 p.m. at the University of Chicago, Ida Noyes Hall 1212 East 59th Street, Chicago. The Non-profit Hiring Fair for Veterans also is sponsored by the Robert R. McCormick Foundation, which is dedicated to increasing the number of Veterans working in the philanthropic and non-profit employment sector. An employment workshop aimed at helping Veterans and transitioning service members leverage military experience to achieve civilian career goals will begin at 11:00 a.m.
More than 30 Chicago-area non-profit and charity organizations, many with outlets throughout Illinois and the Midwest, have positions ready to be filled and will have positions to offer at the event. Because Veterans from the recent conflict have a greater propensity to serve or volunteer in the non-profit sector, this is a great match of skills, interest, needs and opportunities. To be considered, Veterans and others are encouraged to pre-register for this event at Hiringourheroes.org This pre-registration allows employers to review resumes, work experience and job skills prior to the event. Last year, this approach led employers to conduct 577 on-site interviews and make 152 job offers after outreach efforts by IDES, IDVA and other agencies. IDES called more than 20,000 Veterans to make sure that they were aware of this opportunity, while IDVA engaged the veteran community with newsletter information, Public Service Announcements, and social media announcements. Veterans also should register with Illinoisjoblink.com, the stateâ€™s hiring board operated by IDES. It uses the same matching philosophy as the Hiring Our Heroes events. Further, employers can meet federal and state hiring requirements by using Illinoisjoblink.com. Job seekers can build multiple resumes to emphasize different skills and experiences. Business owners can use keyword matching technology to search resumes and find the best candidate. Illinoisjoblink.com is free and compares favorably to private efforts that cost hundreds of dollars. No-cost HR recruitment services for employers and workers are available at the website and at (877) 342-7533. Veterans are sought-after employees for non-profits and charities due to their service training, soft skills and experiences which include respect for authority, embracing responsibility and success in a team-based environment. Veterans and service members also have advanced training in fields ranging from technology and manufacturing to construction and logistics. A state income tax credit of up to $5,000 is available to businesses for each qualified Veteran who is hired. Employers also might qualify for a federal tax credit of up to $9,600 through the Work Opportunity Tax Credit. Other sponsors include the U.S. Department of Labor, the American Legion and Student Veterans of America. Register Today! Last Day for Early Bird Pricing to the National Urban League Conference!